The 100 continues to amaze me week after week. You would think by now I'd be used to being blown away and left without the ability to cohesively put words together to review the show. Yet, I remain amazed when the final credits air each week. It takes me awhile to absorb what I've witnessed and comprehend the intricacies of this world. The 100 Season 2 Episode 5 was the best hour of the series so far. I must include the "so far" because I know the writers, actors and every single person involved in the show will outdo themselves in the future. History repeats itself or so I've been taught. And, why not? 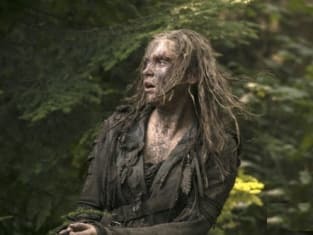 The 100 is a prime example of that theory in action through the Grounder tribes, the Invaders from space and even the superior (and now we know manipulating) Mountain Men. There's something special about The 100 Season 2. The writers found a way to do two things to make the series stand out above others. I'm mystified because I can't figure out the recipe for their secret sauce. First, they were able to broaden the world over these first five episodes without having the characters we've loved (and hated) lost in the transition. Second, characters and storylines have evolved in unorthodox ways, yet the changes feel authentic and the outcomes believable. Finn as a mass murderer? Murphy as a voice of reason? The Mountain Men creating the Reapers? I would have thought someone was joking if they said any of those things would happen. Nevertheless, that's where we are and I buy it. It's been heartbreaking to see the shift from Finn the pacifist to Finn the killer. Now, it's utterly devastating. How did he get there? (I seriously wonder if the radiation is getting to his brain.) He couldn't possibly love Clarke enough to lose it like that, could he? Love does crazy things to people, though. Finn's massacre will have a long-term effect on the possibility of peace between the Arkers and the Grounders. I don't think it's impossible for them to work it out, but the loss suffered by Lincoln's village will be a high hurdle to overcome. The divide will likely be bridged by their common enemy in the Mountain Men. Yes, the Mountain Men are creating the Reapers. That is even more frightening to think about than the Mountain Men using the Grounders as a live stock blood bank. Dante's son is one scary dude and makes his father seem like a saint. It was horrifying to witness the transformation of the lovable Lincoln into a Reaper. He's gone through two phases, how many more before it's irreversible? I fear more for Jasper than I do for Lincoln at this point. Lincoln's strong, determined and I believe will be able to overcome the treatment either on his own or with Octavia's help. Jasper's situation is different. What will Maya's contaminated blood do to his system? While he's able to withstand the environmental radiation, it seems likely his body wouldn't be able to survive on more than that. I'm intrigued to find out how Maya will feel about it if she finds out she was used by Dr. Tsing and injured on purpose. That's my theory at least. I doubted it for a moment when President Wallace got upset at the doctor for experimenting on Jasper, but after his reaction to how Maya was contaminated all doubts went away. Dante's son and Dr. Tsing appears to have set the whole thing up. They have a plan and they don't care if President Wallace is on board or not. Mount Weather is a dangerous place for anyone who wasn't born there. At least outside everyone has a chance at survival whether Arker, Grounder or even Reaper. That said, the former Chancellors found themselves in a precarious situation. While Kane's capture wasn't a surprise, it was unexpected to find Jaha in the same cell with him; the Chancellors reunited. I'm excited by the idea of these two men being forced together to find a way to survive in this unfamiliar world. Will they attempt to negotiate peace? And, if they do, will they be hindered by their ignorance of the people and their ways? I'd put money on the kids brokering an alliance and peace over the Chancellors. "Human Trials" hit the emotional highs and lows. The reunion between Clarke and Abby brought tears to my eyes and that wasn't the only one. Clarke proved that she's the leader of the group by the reception she received. Raven sat outside the entire night waiting for her. The hug between the former rival leaders Clarke and Bellamy was one of the best ever. Octavia's response that she never thought she'd see that happen perfectly narrated the moment. The gang was almost all back together. The reunion with Finn was as emotionally opposite as it could get. After massacring the town, he was relieved to "find" Clarke, but her reaction wasn't to hug him. Instead, she took a step back. Ouch. Everything about that scene was devastating. The hour began with happy reunions, but the world around them quickly returned to the darkness. It's time to hit the comments! Who do you think is in more danger at Mount Weather: Lincoln or Jasper? Which of Clarke's reunions did you like more; Abby, Bellamy or Finn? Did you ever expect to find Murphy being the voice of reason over Finn? Surprised by Kane and Jaha's reunion? Each hour of the series is dense with world building and character reveals, which means you should watch the episode at least twice. You can find links to watch The 100 online right here at TV Fanatic!